To expose your product or service to fleet managers, you need the leading publication for heavy duty trucking fleet news. 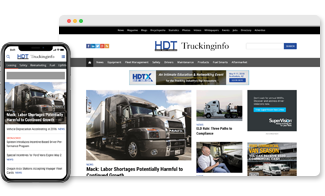 HDT is the industry’s most in-depth information source that targets the commercial truck industry. Access our media kit, BPA statements, and online advertising specs or contact our sales team for more information. HDT reaches more than 115,000 fleet executives, owners, and managers who operate over 14 million light-, medium- and heavy-duty trucks, tractors and vans, and more than 3.7 million trailers. Our mission is to help our subscribers boost their competitive edge by providing the information that they count on when making buying decisions. Offers daily news and in-depth information on equipment, operations, regulations, environmental issues, and more. It's the flagship of HDT's online and digital media offerings, which also include enewsletters, HDT Mobile Site, webinars, HDT's Headline News, Blogs and more. We have the audience you're looking for and through custom publishing and content marketing you can reach them. We'll be your partner in developing a program that is customized to meet your specify marketing objectives. Bobit Business Media has 50 years’ experience researching business-to-business markets and helping OUR customers understand THEIR customers. Our research focuses on actionable RESULTS and data that converts to SALES.